When I read that The Educators’ Spin On It were hosting a Love Books Summer Exchange I knew I had to sign-up! My 5 yr. old loves books, and of course, he loves activities as well! We were paired up with Kathy from Kathys Cluttered Mind, and we received her love books exchange just a few days before we were going on a summer road trip to the beach. 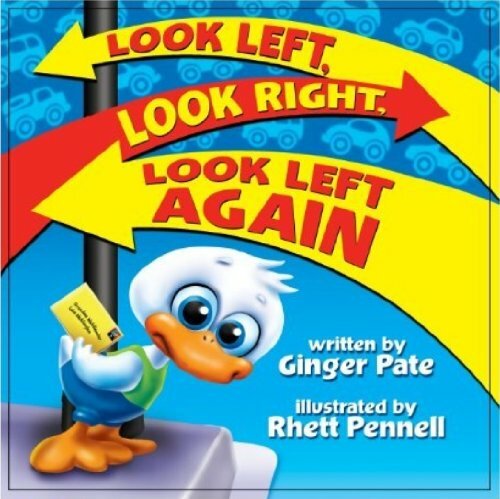 In our package we received the book Look Left,Look Right, Look Left Again Board book by Ginger Pate. The book is about a little duck that needs to mail out a card, but he has to go through some very busy roads, and he has to look left, look right, and look left again. The package came in at a perfect timing! We read the book together before the trip, but I didn’t show him the activities until the day of the trip itself. I used the contents of the package including the book to make a road trip busy box for him. The packet also included 2 small pieces of chalk, a red card stock paper in an octagon shape, a yellow card stock paper with three circles, and three pieces of paper in red, yellow, and green. The packet also had craft sticks, and a small duck themed “thank you” card. The instructions that Kathy included in the packet was for little one to cut out the shapes to make a traffic light, and chalk so he can write the word “Stop” on the red paper, and to cut it out to make a stop sign. 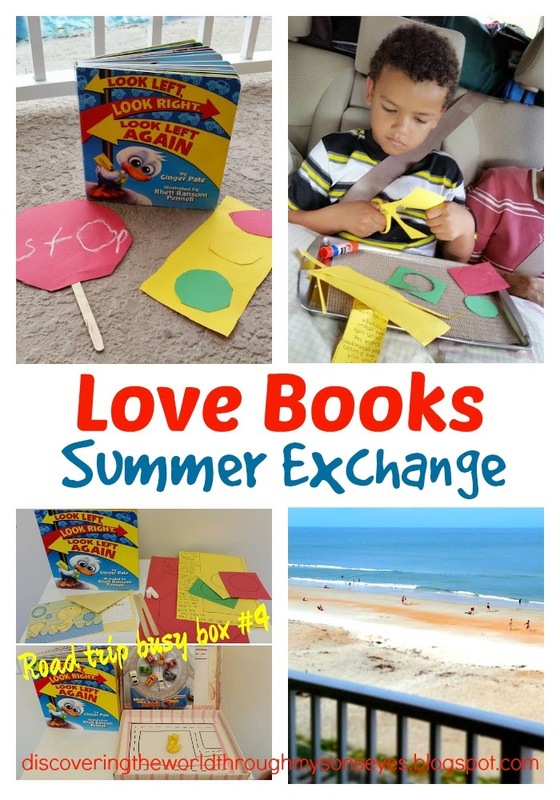 Halfway during our road trip I gave little one his road trip busy box with the love books exchange contents in it. He spent a good while reading his book over again, cutting the shapes, and then playing with the tiny cars, and ducks I included in his busy box. My son had so much fun making the activity! However, the card we have yet to mail out. I love how hands-on this activity was, and I love, love the book! 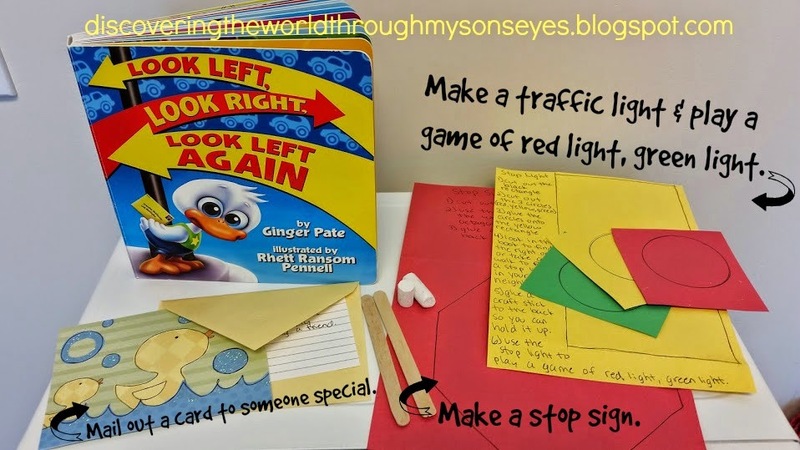 I have been struggling with my child about learning his right side, and left side; and to look left, look right, and look left again when crossing a street! This book has helped him tremendously. Thank you so much to Kathy from Kathys Cluttered Mind, and to the wonderful ladies Amanda and Kim from The Educators’ Spin On It for putting together this super cool summer book exchange. Love this book package! I need to make a stop sign with my kiddos! Previous Post: Happy Birthday U.S.A.!